It's been a long time since I've talked about our chickens. Our current count is 31. Our flock is made up of Golden-Laced Wyandottes (brown and black), Silver-Laced Wyandottes (white and black), Ameraucanas (lighter shades of brown), one lone meat bird (she was on the small side when we harvested so still remains) and several crosses (Wyandotte x Ameraucana) bred by our own birds. 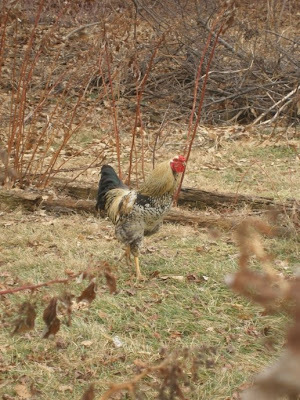 Marv (the rooster in charge) has allowed our 'multi-colored' rooster (a Wyandotte and Ameraucana cross) to exist with the flock. Marv doesn't let him get too close to his favorite girls, but he does get a little action now and again. We're happy for him. Winter can mean less eggs because there is less day light. Hens lay less when they are exposed to less light. Last year we had great success adding a light to their roost area on a timer to extend their day light at both ends of the day. This past fall, we were not quick enough in getting that lamp set up and their egg production came to a screeching halt. That got our attention. As did having to buy three dozen eggs for the first time in almost three years. Ouch. In went the light, but it took the girls a couple weeks to adjust and finally they started laying again. Then came the cold. We got two feet of snow followed by several weeks of frigid temperatures. Those poor birds rarely got off their roost. (Click here to see where our birds live.) Most of the day and night, they stayed huddled together for warmth. Egg production slowed again. Then the bulb burnt out. Heavens. A new bulb went in, the temperatures crawled back up slowly and our pullets ("teenage" or less than a year old hens) finally started giving us some eggs (it takes about 5 months for a chick turned pullet to start laying). Our latest batch of bought laying hen chicks arrived this summer and are of the Silver-Laced Wyandotte variety. Their little pullet eggs are precious, so small they don't stand up very well in the cartons. Regular-sized eggs on the left. 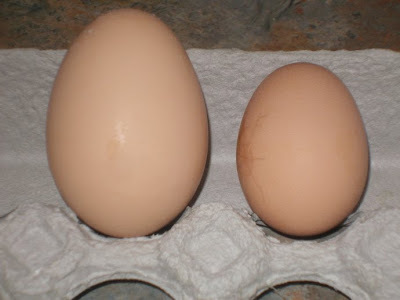 Pullet eggs on the right. The past week or so, we've been collecting 15 eggs a day. We have two families that currently buy eggs from us. If more start laying, we may be looking to add another. 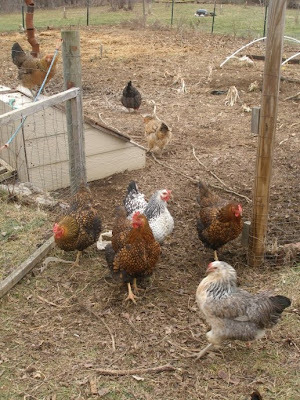 Our chickens were plumb afraid of all that snow and didn't venture out until they could see patches of earth. During the winter months, they are allowed in the garden. 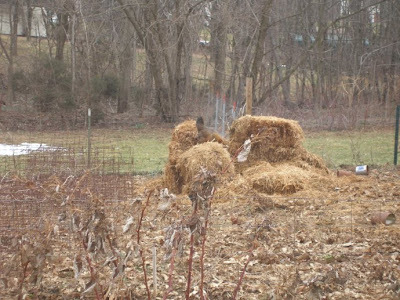 They scratch up the ground, mixing the decomposing straw and leaves (our mulch) into the dirt and eating grubs. This stirring of the ground and their droppings add wonderful organic matter to our garden soil. 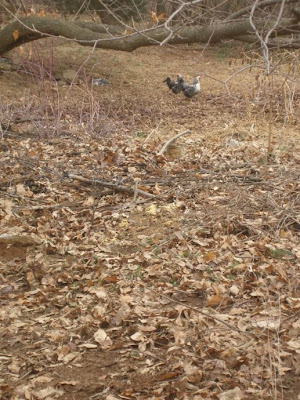 Can you find this hen? They love climbing/flying up on our hay bales- next year's garden mulch. It's so nice to see them exploring their yard once again. I'm almost as excited for them as I am for myself to see those green shoots popping up everywhere. In the meantime, they scratch in the dirt and leaves, find things to climb on and enjoy the fresh air and sunshine. 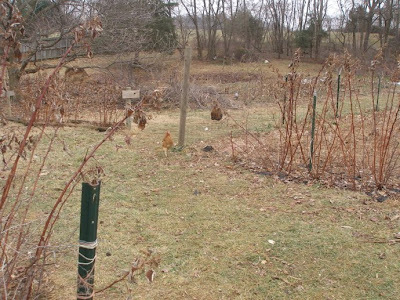 Winter view of back garden and red raspberry canes. I am so envious. 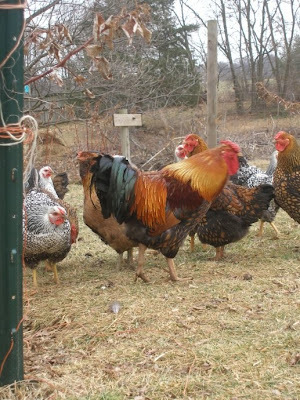 I have wanted a flock of chickens for yyyyyyeeeeaarrrsss. Some day. I loved seeing your coop, run, and chickens. I can never get enough of these creatures! Must be a special gene. I love the idea of letting them run in the garden during the winter. I need to do that, but I'd have to chicken-sit them to guard them from bobcats and coyotes! I don't know why, but he makes me think of the character on Family Affair - Mr. French. I'm dating myself and you are probably much younger and don't remember him. My three hens started laying just this week, after their winter break. I was shocked. I wasn't expecting them to start back until March! It's so great when that happens, isn't it? 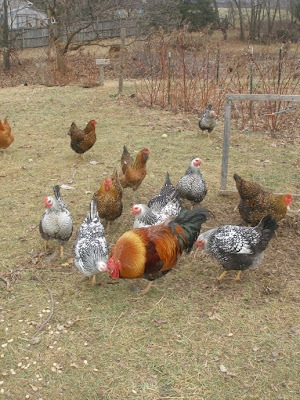 What a lovely flock of chickens, I love your setup it is very similar to ours...even the long run to free range. When I was a lad we had an Ameraucana rooster named Fred...that's all I got for names. 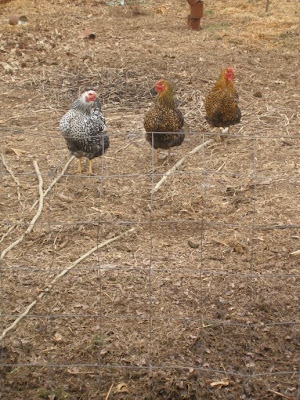 My biggest regret is that we did not get a more mixed flock like yours, all of ours are Rhode Island Reds and it is hard to tell them apart...next time. Thanks, all, for the great name suggestions. I think we're going to go with Merv (Thanks, Michelle!). Marv was named after a great uncle on my side of the family and Jamey has an uncle named Merv on his! Marv and Merv it is. So, whose going to tell them?! 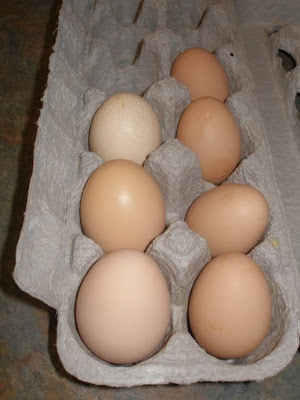 Michelle H., Congrats on your hens starting to lay again. What a happy day! What a great lookin mixed flock! ASC, What a great name suggestion. I wonder if it would mess with his psyche too much if we changed his name?